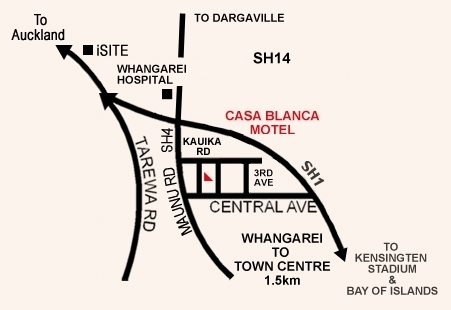 When arriving from the south turn right at Maunu Road off SH 1 then take the first left into Kauika Road - Casa Blanca Motel is on the left between 1st and 2nd avenues. Landmark: Maunu Road is SH 14. Look for the sign Hospital and Dargaville to the left - then turn right. When arriving from the north look for the Casa Blanca sign on the left just after the bend after Central Avenue. Landmark: Burger King and Caltec are on the corner of Selwyn Avenue. Central Avenue is the next set of traffic lights. Whangarei is a 2.5 hour drive north of Auckland and 45 minutes from the Bay of Islands. We are ideally located for exploring Northland and provide an affordable base for your travels all year round. Casa Blanca Motel is a 10 minute walk from the centre of Whangarei (3 minute drive to the Vine Street car park). Whangarei Hospital, NorthTec, Kensington Stadium/International Hockey Turf, Cobham Oval and ITM Stadium are all only a 5-minute drive away.